A well-written and exciting adventure story that draws on classic fantasy and storytelling to create an in-depth world and characters that you won't want to leave behind. It's similar to series like His Dark Materials, Narnia, Harry Potter and Brotherband. What I especially liked about this were the strong female characters, which are hard to find in these sorts of kids' books. I work in a bookstore and see firsthand how children's books are very gendered -- ie, "girly" schoolgirl characters for girls and clever action heroes for boys, so it's very refreshing when something like this comes along. Anni is a girl, but she's tough and adventurous, so she would appeal as a lead to boys and girls, much like Lyra in Northern Lights. Duck, a boy she meets on her journey, is a nice foil to her and their friendship is compelling. 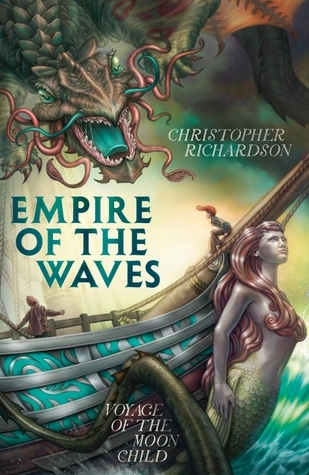 'Empire of the Waves' is a fun and thrilling novel for the 9 to 15-year-old market. Anyone with an adventurous spirit will appreciate it. Sign into Goodreads to see if any of your friends have read Empire of the Waves.